For a smaller size of horse, the American Sorraia Mustang is a tough one. Any mare that can endure being captured by Native Americans many years ago and also have the ability to adapt to any surroundings is a well formed breed. 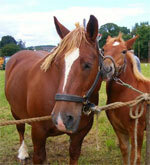 A typical quality of the breed is a larger head. They have extremely good endurance capabilities and can easily be alone all day long. The American Sorraia Mustang is an easy horse to get along with. 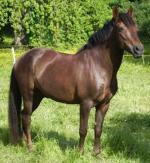 They are very flexible and open to be trained by their owners with ease. As some horses will run away if a barn door is left open, this one definitely will not. The Sorraia breed is noble, strong, and courageous. They are very loyal creatures and adore spending time with their owners and families alike. The Sorraia breed reaches a height of anywhere from 57 to 60 inches tall, or around fourteen hands. They bode a large head and an elongated neck. With a convex profile and very capable legs, the breed has the ability to run for miles with ease. They have a unique form of striping that comes with age in some variations of the horse that appear to be somewhat similar to a zebra pattern. The Sorraias are a very energetic animals. They are up for any challenge and also have the reputation of being very flexible and horses that learn the ropes in record speed. Clear thinkers and somewhat childlike, they are happy to roam all day long, but still need some caring for periodically during the day. Since they have a tendency to mature fairly slower than some other breeds, they will need to still run around much like when they were babies, with some owners even saddling them for their first few years of life. You and your vet can manage how long to keep them under the saddle after a few checkups. 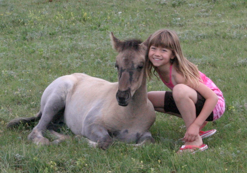 The Sorraia Mustang breed has a history developing from back in the twentieth century. Exerts have been trying to find more facts in the breed as even research aiming to prove their DNA has been questionable at best. The issue appears to be that many of these types are so closely thought of as other horses of Iberian decent used for hunting that researchers cannot closely examine the facts that truly make up this particular American Sorraia form. Once owned by the rich of Portuguese, they went on to live on farm lands and their breed began to become extinct from there on out. Currently, they reside in a few places in the world such as Northern America, Portugal, and Germany. Most are trying to preserve these animals and permit them to reside in a lifestyle that is wild and not kept in a barn. Several foundations have been created to preserve them as currently statistics showing less than a few hundred Sorraia horses are currently walking the Earth.